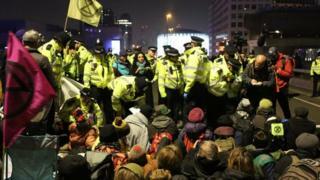 But activists camped overnight to ensure blockades continued at Waterloo Bridge, Millbank and Oxford Circus. Transport for London warned bus users that routes would “remain on diversion / curtailment in central London due to on-going protest which are blocking roads”. An order has restricted protesters to gathering in the area around Marble Arch.